Negotiating a higher salary is never an easy or comfortable task. 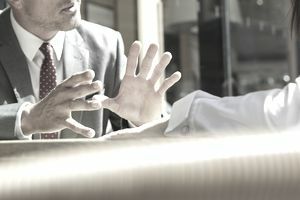 Here are a few guidelines to help you get through the negotiation process with minimal stress, and end up with a ​salary that is acceptable for both you and the employer. Most career experts will say you have the most leverage in negotiating a salary after you have been offered the job; at this point, the employer is certain they want to hire you. However, avoid trying to negotiate immediately after receiving the offer and before getting additional details on the rest of the compensation package. You need to take some time to consider everything being offered. Also, try your best to avoid bringing up salary or, if asked, giving specific figures during the job interview. That time should be used to find out more about the job and to determine whether you want to work for the employer. You can't be expected to negotiate fairly if you don't have all the information you need. If you have any outstanding questions about what you will be expected to do, the results you will need to produce, and any other benefits or perks the employer offers, find the answers to those questions before you start talking about how much you'll get paid. discussions with people who have a similar job. Also consider vacation time, any other bonuses, and opportunities for professional development, including tuition assistance. As an IT worker, keeping your skills up-to-date is very important, so any opportunity for skills development should receive significant consideration when making your decision. Some employers will try to low-ball you, but others may not. Ask for a salary that is somewhat higher than what you would really like (but not unreasonably high), so you have leeway to negotiate down to a number that will still work for you and will not be below your value or expectations. Also try to demonstrate to the employer why you are worth the salary you are requesting by continuously reminding them of what you can bring to the table to help save money, make the IT department more efficient, or implement new ideas. At all times, remain polite and positive in your discussions about salary. Even if you're excited about the job but insulted by the initial offer, don't express your disgust to the employer and sound off about how much more you are worth. Focus instead on communicating to the employer how interested you are in the job, and how much you know you can contribute to the company, and then mention that that are certain areas you would like to discuss before coming to final salary agreement. The main idea is to arrive at a win-win situation: one where the salary is acceptable to you, but also leaves the employer assured that they are hiring someone who is worth the money they will be paying. Avoid making outright demands, giving ultimatums, or trying manipulative tactics at any point. For example, if you receive a few job offers at once, it's not a good idea to pit employers against each other in the hopes that they will try to outbid one other. This may leave a sour taste in the employers' mouths and may cause them to be less flexible than they normally would be if you had stayed positive. Try to take things slowly, so you have enough time to do your research and prepare for the negotiation process. If you don't rush, you'll feel more confident throughout the whole process, and you won't make any impulsive decisions that you will later regret. Also, expect negotiations to happen in several stages, and don't be surprised if they take days or even a couple of weeks to be finalized. Once you've come up with a mutually acceptable salary, make sure the employer gives you a written copy of the job offer, stating the job description, expectations, other important details, and the salary. Don't try to go back and negotiate for more after you've accepted the offer, as you will have little to no leverage at that point. Do all of your negotiating work before saying "yes" to the job.